EXCLUSIVE: The second series of the Irish-filmed historical drama ‘Camelot’ has not been greenlit for production in 2011 by US Network Starz. Despite attracting the largest ever opening for a new drama series on Starz for its US premiere on April 1st and large UK audiences of 2.5 million for its opening night on Channel 4, IFTN have confirmed that the second series of the epic series will not go into production. 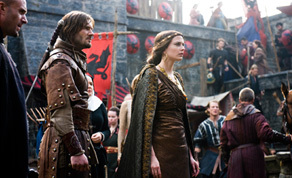 The industry will view this as a blow to the film community in Ireland, with the first series of ‘Camelot’ filming in Wicklow’s Ardmore Studios for six months during 2010, bringing an estimated $32 million to the Irish industry. In addition to its US screenings, ‘Camelot’ series one was also broadcasted by Channel 4 and on Irish television on RTÉ and had sold to other international broadcasters including RTL (Netherlands), DBS (Israel) and Sony AXN (Pan-Asia). Based on Thomas Malory’s 15th century book, ‘Le Morte d’Arthur’, ‘Camelot’ looks to bring the saga of King Arthur to modern audiences. Its all-star cast in the first series included Joseph Fiennes (Flash Forward), Eva Green (Cracks), Jamie Campbell Bower (Twilight), Tamsin Egerton (St Trinians), Claire Forlani (Meet Joe Black) and Peter Mooney (Summer Blood). The epic series was a co-production between Octagon Films and Take 5 Productions in Canada for Starz in US and distributed by GK outside of the US and Canada. IFTN understands that a number of factors were considered by the network in relation to Season Two, and that they have ruled out production of Season Two for 2011. Irish production company Octagon is currently shooting ‘The Borgias’ for Showtime in Budapest; wrapping production on series two of the RTÉ drama ‘Love/Hate’ in Dublin, and will begin production of the next instalment of RTÉ drama series ‘RAW’ within the coming weeks.